Personality: Reed is a man of many hats--for how warm and friendly he can be, he is equally cold, distant, and outright rude. It isn't in his nature to be that way, he is just used to closing himself off from people (and by extension the world) as a means to protect himself from the harshness of reality. He has a real hard time seeming vulnerable, or even projecting an image of any emotion other than firm stoicism, because he was always bullied for being too in tune with his emotions. Instead, he prefers to build walls, shutting people out at a moment's notice, refusing to make connections with other human beings. This being the case, Reed is often lonely, and often confers only with his own thoughts, attempting to fill the void of companionship he sorely lacks. He has an extremely difficult time even making small talk or light conversation with other people as well, and this weighs heavily on his conscience and on his ability to communicate with anyone in general. When his icy exterior does thaw, however, Reed considers those people to be lifelong relationships, very much appreciating the bonds he forms and considers them equivalent to family. He is fiercely loyal, and passionate, and often pours his emotions out into music, which he has always had an inherent knack for. Music - Being a man of extreme passion and sensitivity, Reed often turns to music to express how he feels, whether to other people or alone, in order to release those pent up emotions. His favorite instrument by far is the violin, though he has shown unbridled potential with most known instruments. Allegra - Reed, being aloof, has found one lifelong companion: his cat. Allegra, his cat, has been with him ever since early childhood, and despite age and reason, Allegra is young and vivacious as she always was. When in need of a friend or a helping hand, Reed always seeks out his feline partner to assuage his anxieties. Dissonance - A fan of tonal, aesthetically pleasurable sounds, "dissonance" applies to much of everything that Reed dislikes. Anything that does not seem harmonious with the environment invokes a petite ire in him that makes him rather irritable. It's not his fault, though, sweet sounding melodies are one of the few things that regulate his unfortunate mood swings. Family - Despite considering all those who are close to him as something akin to family, Reed absolutely despises his. It is partly why Reed chooses to search elsewhere for familial bonds--he never felt it with his biological one. Tight-knit families make him boil with envy, and familial love makes him pregnant with rage. He doesn't want to be so consumed by sin, but he can't help it. Aspirations: Of all things someone like Reed could hope to attain, with all his talent, and motivation, and ambition, there is but one goal that Reed truly aspires for--happiness. Many a night he would like in bed, looking out to the stars, only to wish for the same thing each night, in hopes that tomorrow would be a better day. He has gone through it all--escape, adrenaline, a life of servitude, but still nothing placates his deep, profound sadness. He feels most happy, and most at east (mentally), when he plays music, often a depressing melody that moves him to tears every time he plays, and is unable to finish. He hopes that in finding some level of happiness, or even to feel content for just a moment, he will be able to finish his heart's song. Phobias/fears: While a great deal of things upset Reed's everyday attitude, he is truly afraid of succumbing to his sadness. Nobody ever talked about it, but this "sadness," a sickness, is a curse on his family. His mother's side, which she never talks about, are sparse in number, and despite all being semi-successful magicians, all took their own life after years of battling with various arrays of inner turmoil. While Reed has been tempted to walk down that path at times, he truly fears that one day, he will become just another anecdote his family would tell about the curse that was placed upon his family. He is already a disappointment to his father, and mother, he would hate to add to that by being a cliche. Appearance: Reed is dressed to the nines in relatively posh attire he spent years saving up money for to show off for people. His hair is, and he won't admit it, painstakingly coiffed to have that messy, "I didn't care enough but I cared a little bit" hair-do that accentuates his hazel brown eyes. 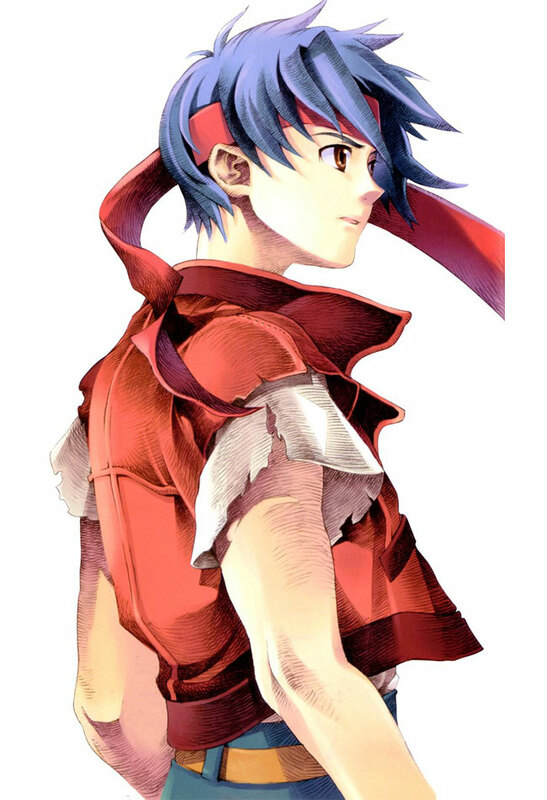 He dons various bandanna around his head, most notably his trademark red, as a counter to family tradition, to go against his "noble" heritage. He wears a red tunic that falls just above his waistline, form-fitting, with a white undershirt that that falls just past the sleeves of his tunic, providing some level of "noble fashion". On his legs he wears higher-quality blue pants, tightened around his waist by your standard leather belt and buckle. On his feet are tan boots that are both sturdy and depending, evening out his somewhat simple outfit. 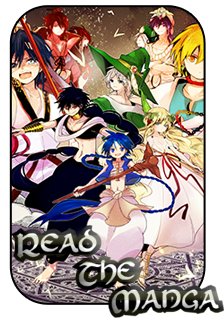 History: A precocious child, Reed is the only son and third child of a family of woman magicians and male swordsmen native to the area of Magnostadt. Despite the family tradition of the women being naturally gifted in magic, and the men formidable warriors in their own right, Reed was the first child born to this legacy with the innate ability to use magic, and thus blessed by the rukh. A trying situation for sure, Reed was often the subject of ridicule and jeers from family and peers, most of the time perceived as too feminine or inferior to the men in the family. Thus, Reed sequestered himself in his room, often enveloped with his studies and burgeoning magical abilities. At a remarkably young age, Reed had mastered the use and manipulation of sound rukh, often creating fleeting melodies through the air all throughout the castle. Despite having this incredible ability, and the first of his family to use sound magic with such proficiency, his abilities were thought to be even more unimpressive, as sound magic was considered weak, pacifistic, and wholly underwhelming. He found solidarity with his sisters--Lyra and Coda--both precocious children in their own right, as they encouraged and facilitated a warm and friendly environment for Reed to grow and cultivate his unique abilities. Where Lyra was the prodigal magician, a master of gravity magic before she even attended Magnosadt, Coda was the other black sheep of the family, being a woman and immensely talented in swordplay. Reed learned much from his sisters and the three of them were as tight-knit and close a family as any other family for a short while. On the eve of Reed's thirteenth birthday, Lyra was accepted into Magnostadt, having been waiting to apply until she was an adult and Reed was old enough to handle living at home, and made leave for the academy. While her departure was rough on Reed and Coda, they stuck together to shield each other from the barrage of insults family members, and their parents, would fling at them for their lack of upholding the familial status quo and their "utter disregard" for tradition. It was unfair, both children understood that, but still psychologically trying to constantly live in such harsh and unwelcoming conditions. Two years passed and while Reed was hastily preparing to move to Magnostadt and attend the academy, hopefully living with and learning more under his oldest sister, Coda was still stuck at home, having been forbidden to travel to Reim and become a warrior. Furthermore, Reed's wish to apply to Magnostadt was also barred, for it would bring his mother great shame to have a man from her family attend the academy. Wishing to not stay at home any longer, both children planned their great escape from their parents' estate, longing to liberate themselves from such a negative environment. Reed got all his arrangements in order--his instruments, his meticulous and diligent notes, his extensive library of music and sound magic--it was all there, ready to be taken to the prestigious academy where he will one day graduate and live his own life, free from the oppressive clutches of his parents. Coda too was eager to leave the villa and become a world renowned swordswoman that men would come to fear should they ever cross her path. Yet, happy endings were not in the cards for these siblings. During their escape, a servant of the villa alerted their parents of their plans to escape, and fearing the absolute worst to their reputation, blockaded the rooms. With no other plans for escape, they decided to escape out of Reed's balcony window, where they could hopefully wait in the brush and escape after some distract (or a well-placed kick to any of these guards' privates). The plan worked successfully enough, both Reed and Coda were able rappel down tied together curtains and excellent teamwork. Seeing a chance to escape out of an empty pocket in security, Coda and Reed took off, fleeing from their parents' house and the sheltered life they lived, until a guard fired an arrow (aimed definitely for Reed) that connected with Coda, piercing her right through the chest. Reed let out a cry in disbelief, horror, and agony--it was like a part of his body had been ripped out from him. Coda made no noise, parted with no final words, only the look of defeat as she was unable to reach her goal. Reed, fearing that the same fate would befall him should he stay with his sister, took off for Magnostadt Academy, hoping to tell his older sister Lyra what happened. "You're crazy, Lyra! Absolutely crazy!" He yelled, his voice quaking and overcome with emotion, "You can't sit there and defend our parents...they did it. THEY KILLED HER!" His sister only sat in front of him, a cool demeanor, her hands placed elegantly on her lap as she closed her eyes and contemplated her next words. "I understand your feelings Reed, but..." Lyra explained, taking a minute to observe the look on her brother's face. He was obviously worn-down, driven mad by survivor's remorse and crazy from sleepless nights and self-induced starvation. "But...I do not truly think our parents would want their children dead. They were...confused...but not heartless." Reed only slammed his fist against the table, his body aching with anger and frustration. He wanted to yell, he wanted to scream at the top of his lungs, he wanted to destroy this room, the windows, the entire damn school out of sheer anger for what had happened. Yet, there was always something so calming about his oldest sister. He could see that she, too, was hurting, yet she hid her sadness, and her confusion, and her sorrow in order to take care of her brother. Reed loosened the tension in his fist, and his body began to calm just a little, before walking over to his sister and collapsing into her lap. He sobbed, he wept, he could've drowned in a pool of his tears, and Lyra cradled his head in her lap, softly weeping for the death of her younger sister. "Tonight, Reed, we grieve," Lyra said, her eyes now indignant and with purpose, "And tomorrow, we avenge." [b]Trait Description:[/b] Blessed and loved by the rukh, magicians have a deeper connection with it than any other race. [*]Able to see the rukh and communicate with it. [*]Access to the "Borg" racial ability. [b]Requirements/Drawbacks:[/b] Must wave wand in circular motion. [b]Requirements/Drawbacks:[/b] Must wave wand, use wand as proxy "sword". [b]Requirements/Drawbacks:[/b] Must wave wand rapidly. [b]Requirements/Drawbacks:[/b] Must wave wand/conduct the spell. Reed waves his wand around him in effortless motion, creating a tangible, icy field that spreads out up to 10m around him, freezing enemies for up to 3 turns. Using the power of sound and wind, Reed swings his wand around him to create four pockets of air that begin to vibrate and hum intensely until they burst, each explosion causing D tier damage and disorienting nearby targets. Reed wistfully conducts the rukh around him, manipulating both the powers of sound and water to incur concurrent bouts of paralyzing pain for C tier damage up to 3m surrounding him. The spell’s abilities emphasize the paralytic aspect of cymatic magic, leaving enemies paralyzed for 3 turns. Reed brings his wand to his chest and focuses intently on the rukh around him, accumulating a collection of magoi before releasing an immense elegy of sound that severely damages all those around him for A tier damage up to 3m around him. [b]Appearance:[/b] The wand is fashioned in the shape of a violin bowstring, Reed's most proficient instrument, to allow him to better conduct his musical abilities. It is approximately 35cm long, and he holds the bow as if he were to play a violin. The bow is a finished and stained wood approximately 5cm in diameter, light in his hands, and the bowstring itself is made from soft, white horsehair. [b]Appearance:[/b] A two meter long creature. A strange, green mix between a fox, leopard, raccoon, tiger, and bunny. It has long, bunny-like ears and a muzzle and nose similar to a bunny's. Its tail is fluffy, thick, and long, resembling a raccoon's own tail. It has leopard spots on its hind legs and tiger stripes on its back. It behaves much like a feline. [b]Personality:[/b] A rambunctious, tomboyish girl, she is the only female warrior within the entire Harper clan. Yet, as fierce and stubborn as she is, there is a firm sense of righteousness that dwells within her. Despite overcoming much struggle, she still views the world with an intense sense of idealism--deeper than her two siblings, for sure. [b]Appearance:[/b] Ever the tomboy, Coda sports an appearance fit for a true warrior. With her blue hair cut short, it hangs just past her chin, revealing itself to be a quite fashionable bob. She wears noble regalia--a white leotard with a blue, cloth breastplate and blue skirt that falls to her upper thigh. On her feet she wears black, ankle-length boots, with stockings that run up to her thighs. On her arms she dons cloth gauntlets that fall encircle her wrist, with one strand caught around her finger. In her hair she wears a beautiful, gold pin in the shape of a musical note, an insignia of her family's. [b]History:[/b] A sibling of Reed and Lyra's, Coda was inseparable from them. While she suffered some of the same abuse as Reed did during his childhood, she was unfortunately not able to make it out freely, leaving Reed to believe she had perished in the streets. Now she has resurfaced and Reed and Lyra have many questions. [b]Personality:[/b] The oldest of the Harper children, she is the most sensible and mature of the three. She is often the one to insert rationality into the three children's shenanigans, and also the child who took it upon herself to mother her two younger siblings when they were shunned by her family. While not as musically inclined as Coda or Reed, Lyra is a talented dancer, utilizing knowledge of music into a different form. Though, Lyra is not without eccentricities that set her apart from her family--she is the only magician in the Harper pantheon that does not primarily specialize in sound magic. Her specialty is water--ice specifically--which does give her the ever so slight tinge of feeling like an outcast. Still, she is a fiercely talented magician in her own right and often prefers to use sound magic in the form of dance to compensate for her lack of skill with it. [b]Appearance:[/b] A statuesque stunner, Lyra is widely regarded as the most beautiful of the three children. She is draped in stylized noble regalia, dressed in a flowing, black dancer's garb. [b]History:[/b] The only child not targeted by their parents' verbal abuse, Lyra was uncharacteristically kind and gentle to her siblings. Thought of as a surrogate mother figure, Lyra felt responsible for their happiness. When she was tasked to attend Magnostadt Academy, she felt conflicted leaving her two younger siblings behind, but was forced to go by her parents. Now, feeling regret over not having been with her brother and sister the night they escaped their mansion in a town in Magnostadt, she only wishes to find closure for her sister's disappearance. She has knowledge that Coda may not be dead, but just how did she gain this knowledge? Personality: A rambunctious, tomboyish girl, she is the only female warrior within the entire Harper clan. Yet, as fierce and stubborn as she is, there is a firm sense of righteousness that dwells within her. Despite overcoming much struggle, she still views the world with an intense sense of idealism--deeper than her two siblings, for sure. Appearance: Ever the tomboy, Coda sports an appearance fit for a true warrior. With her blue hair cut short, it hangs just past her chin, revealing itself to be a quite fashionable bob. She wears noble regalia--a white leotard with a blue, cloth breastplate and blue skirt that falls to her upper thigh. On her feet she wears black, ankle-length boots, with stockings that run up to her thighs. On her arms she dons cloth gauntlets that fall encircle her wrist, with one strand caught around her finger. In her hair she wears a beautiful, gold pin in the shape of a musical note, an insignia of her family's. History: A sibling of Reed and Lyra's, Coda was inseparable from them. While she suffered some of the same abuse as Reed did during his childhood, she was unfortunately not able to make it out freely, leaving Reed to believe she had perished in the streets. Now she has resurfaced and Reed and Lyra have many questions. Personality: The oldest of the Harper children, she is the most sensible and mature of the three. She is often the one to insert rationality into the three children's shenanigans, and also the child who took it upon herself to mother her two younger siblings when they were shunned by her family. While not as musically inclined as Coda or Reed, Lyra is a talented dancer, utilizing knowledge of music into a different form. Though, Lyra is not without eccentricities that set her apart from her family--she is the only magician in the Harper pantheon that does not primarily specialize in sound magic. Her specialty is water--ice specifically--which does give her the ever so slight tinge of feeling like an outcast. Still, she is a fiercely talented magician in her own right and often prefers to use sound magic in the form of dance to compensate for her lack of skill with it. Appearance: A statuesque stunner, Lyra is widely regarded as the most beautiful of the three children. She is draped in stylized noble regalia, dressed in a flowing, black dancer's garb. History: The only child not targeted by their parents' verbal abuse, Lyra was uncharacteristically kind and gentle to her siblings. Thought of as a surrogate mother figure, Lyra felt responsible for their happiness. When she was tasked to attend Magnostadt Academy, she felt conflicted leaving her two younger siblings behind, but was forced to go by her parents. Now, feeling regret over not having been with her brother and sister the night they escaped their mansion in a town in Magnostadt, she only wishes to find closure for her sister's disappearance. She has knowledge that Coda may not be dead, but just how did she gain this knowledge?